In the city, you can see many tall buildings and modern houses. But in rural and semi-rural places, cottages are mostly seen and a quite popular type of residence. It is typically a small and intimate dwelling of farm workers and laborers. Today, more people want a traditional home, so they prefer to have a modern cottage designed house. The others restore their old cottage where they usually spend holidays with friends and family. Cottages are now strategically located near beaches, rivers or lakes which are mostly built for vacations. Tourist industry or private individuals make cottages for renting accommodations which currently widely practiced in different countries. When building cottages, one of the main thing to consider is the flooring choices. Finding the right surface to walk on which will complement the overall look of the interior of your home. With several options available, wood flooring is the best fit for cottage flooring. Since the durability, ease of maintenance and cost-effective are the primary needs of prospective homeowners. The performance of a wood flooring depends on the species of woods being used. Engineered wood flooring is one of the excellent and in-demand floor options for house interiors. Engineered wood flooring is made of high-quality plywood with a thin slice of hardwood on top of its base. It can be easily installed by stapling, nailing or even with just a wood glue. Hickory and red oak are only two of the engineered flooring species that are popular choices for homeowners. Although it can be moisture resistant, it can become whittle if used beyond normal conditions. It is more heat resistant compared to solid wood and a versatile for flooring options. Another great choice of wood for cottages is the solid oak flooring. It is made up of hardwood materials from top to its bottom. Oak is one of the most popular species of solid woods because of it's strong wear layer, easy to clean, eco-friendly and inexpensive choice for cottage flooring. It provides a cozy interior that looks timeless and elegant. Oak flooring can cope for decades, but it's not recommended to be installed in areas like bathroom, basement, and kitchens. It can hold moisture, and it is best to avoid constant exposure to water because it can expand and contracts though it can withstand water, it may never return entirely to its former shape. If you want to create a brand new surface, solid woods can be sanded, but it can eventually compromise its structure. The means of installation can be by stapling, nailing or glue. But you may also need to hire floor installers because solid woods are difficult to install than the engineered woods. Engineered wood flooring and solid oak flooring are excellent choices for cottages. These two types flooring are made from 100 percent real wood. Either of the two is a healthy living option because it can bring health benefits by eliminating allergens and breeding of dust mites. You can buy either of the two according to your cottage flooring preference. 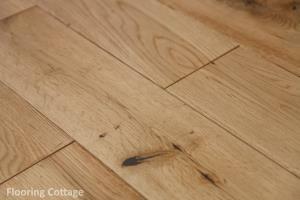 Find the variety of solid oak flooring at Flooringcottage.co.uk, the #1 oak flooring supplier in the UK. They currently have a Solid Oak Flooring Sale which you can get solid oak flooring at 40% OFF from its original price. You can choose wood colors that match your interior home design at affordable prices. Even free samples and quotes are made available to their valued customers. Get the value of your money with the wide range of high-quality products that definitely without breaking the bank. With different options of secure online payment and fast delivery service, your wood flooring needs are within your reach. Will Cool Car Tech Eliminate Insurance Premiums? Help Your Child Embrace Their Artistic Side! Is virtual reality a good or bad thing?